IRWINDALE >> A Baldwin Park man accused of seriously injuring a 70-year-old woman in a hit-and-run crash while driving a stolen car in Irwindale, then trying to carjack a passing motorist, faces numerous criminal charges, police said Saturday. 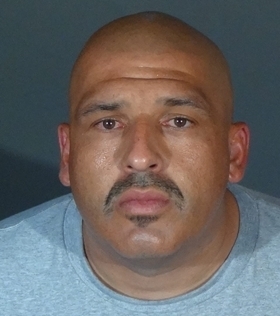 Mario Anthony Barillas, 37, was found and arrested by investigators on Tuesday on suspicion of hit-and-run involving injury, possession of a stolen car, attempted carjacking, reckless driving and violating his pre-existing probation stemming from a narcotics-related conviction, according to Irwindale police Sgt. Rudy Gatto. The initial crash took place about 3:10 p.m. on July 29 on Arrow Highway, just east of Bleecker Street. Barillas was driving a stolen, 2010 Nissan Pathfinder SUV at high speed when the car slammed into a small 2004 Dodge pickup truck, Gatto said. The truck was struck on the passenger side as it made a left turn into a driveway from Arrow Highway. The pickup truck was being driven by 70-year-old man, according to Gatto. His wife, also 70, was riding as a passenger as the couple headed to drop of recyclables at a nearby recycling center. Firefighters had to free the woman from the wreckage, officials said. She was taken to an area hospital where she received emergency surgery to treat injuries described as “major, Irwindale police said in a written statement. Her husband suffered apparently minor injuries, Gatto added. But the driver of Nissan, which was later determined to have been reported stolen, had fled the scene on foot. “The suspect attempted to carjack another nearby vehicle as he was leaving the accident scene, however he was unsuccessful,” according to the police statement. The driver of that car managed to speed away before being carjacked, Gatto said. Police had yet to find the victim of the failed carjacking on Heintz Street, but are hoping to speak with the driver. Officers searched the area but did not find the hit-and-run driver. Detectives continued their investigation in the days that followed, interviewing many witnesses and collecting footage from area video surveillance cameras, Gatto said. They ultimately identified Barillas as the suspect, obtained an arrest warrant and took him into custody in Covina on Tuesday. Barillas was being held in lieu of $1.01 million bail at the Glendora Police Department’s jail pending his next court appearance, scheduled Aug. 24 in the West Covina branch of Los Angeles County Superior Court, booking records show. This entry was posted in Baldwin Park, Grand Theft Auto, hit-and-run, Irwindale by Brian Day. Bookmark the permalink.